In varsity boys’ soccer, yesterday’s win at home (7-0) over the Ranney School advanced the Knights to the semifinals of the NJSIAA South Jersey, Non-Public B tournament. 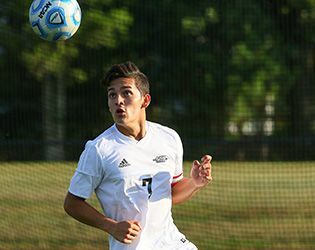 Leading the scoring were Kevin Brito '17 with three goals and one assist. Anes Mrkulic '17 recorded two goals and two assists; Steven Bednarsky '17 and Bailey Gano '18 each contributed one goal and one assist and Tyler Merna '19 and Dan Shen '19 had one assist apiece. On goal, Alexander Roch '18 made two saves for Gill. Reflecting on the win, head coach Tony Bednarsky said, "This was a good way to begin the state tournament. For quite a while, we couldn’t bring a full complement of players to the field, due to illnesses and injuries. But the team is healthy right now, and that's good news. We are excited for Monday’s game." On Monday, the boys will face Gloucester Catholic in the semifinals at Gill St. Bernard's. Cox Lodge will be open, where the Booster Club will be selling concessions during the game. Go Knights!